I am not exactly old yet although I feel it, but I have noticed that once I hit 30 everything got a little harder. I was no longer losing weight like I did when in my teens and 20's, I was starting to show that I was worn out and tired. And yeah I was just missing that youthful look. 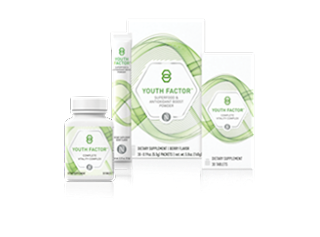 I found out about the Youth Factor Complete Vitality Complex and Superfood & Antioxidant Boost. This is a one of a kind product which helps you look and feel like you are back in your 20's. Instead of a handful of pills and an overwhelming regimen, support overall wellness and fight the signs of aging with YOUTHFACTOR™Complete Vitality Complex and Superfood & Antioxidant Boost, a duo of nutritional supplements—one a tablet, the other a powder. You can find this amazing product here, along with other products to help you feel and look younger, there is truly something for everyone.